Have you ever wanted to know what it’s like to work with REAL wolves up close? 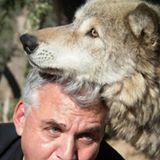 Our guest, Ken Ferber is here to talk about the many years of being a volunteer for a wolf Sanctuary called the Wolf Connection. Wolf Connection is a youth education and empowerment program, with rescued wolves and wolf dogs as the centerpiece. Wolf Connection believes that the deep understanding of our relationships with animals and the environment is paramount in our development as individuals, productive societies, and sustainable civilization on this planet. With the help of the animals, young men and women reconnect with nature, learn to be of service by responsibly caring for another being, and work towards becoming the kind of person they want to be. The animals help them focus on their impulses, feelings and emotions in a constructive way; they learn to forgive and give others (and themselves) a second chance. They also reflect on, and learn about, loyalty, honesty, integrity, courage, contribution to society, commitment, sense of purpose, and self confidence.